Products for health in a supplement way, To bring a healthy life, each, and everyday. Here is the food, or a tablet for sure, I'll research for the better, to open the door. If it's for you, for certain you'll want to know, A healthy mind, and body raring to go. ​To want to make a difference, in kind, To say, to check, to taste, to love, to find. Vitamin D; This is a vitamin that we cannot do without. The best resource of vitamin D is the sun. And as we are told to cover up with sun-cream our bodies do not absorb the good vitamins from the sun. Yes the sun has it's benefits, even though we are warned not to sunbathe too much. Goats milk is a good way of taking in the Vitamin D supplement. Even a small Vitamin D tablet will give you the portion of the Vitamin D that you need. It's a supplement that you need everyday. ​Vitamin D is the miracle Vitamin, that's why if you are not getting suffient sunlight you can be prone to many problems, so you do have to supplement the sunlight. A deficency can cause many cancers. Vitamin D has a significant role in skin rejuvenation, and protection. Calcitriol contributes to cell repair, growth, and metabolism. It can slow down the aging process. Vitamin D is known to inpact your overall immunity, which can provide protection against seaconal colds, and flu. Vitamin D is also a help in Depression. It also can help with Asthma, Vitamin D3 is the most beneficial to your body. Overall to achieve your best possible health, you should you should minumise junk food. Lack of sun exposure, lack of exercise. Keeping a check on your health, and well-being. Keeping your blood vessels, heart, bones, organs, and tissues healthy. ​Aiming to to keep your Vitamin D levels through a combination of strutures, and strategies- natural sun exposure, food sources, and oral supplements. Making sure that you monitor yourself. The next aim is to regulate your Vitamin K levels through food sources such as leafy green vegetables, raw milk, and cheeses. With oral supplements at the dose required. ​Manuka Honey. This is a magic potion, it wards off bacteria. Something you must have in the fridge, or larder. A teaspoon of this honey will set your life for they day. The benefits of Lemons, Oranges. Perhaps a slight adding of lime to the juice creates the benefits of life. I will be checking many fruits as I go along, and as I travel I will look for the most exotic fruits to eat. I always drink water as the body is water based, and we tend to lose a great deal of water throughout the day, we have a need to replenish. Dehydration can be linked to many ailments, such as migraine, kidney problems, heart, liver, the list is endless. Having drunk warm lemon water in the morning for a long time now, it has most certainly helped my asthma, those inhalers are in the drawer just in-case. So I can recommend lemon water, but I have noticed since I stayed at the Hotel Cavour in Florence, and may I say they had a wonderful glass container full of oranges, and lemons with water. The Holiday Inn at Stratford International also has a glass container with water, and lemons in for the use of the water drinker. There are more glass water jugs in restaurants that have oranges in them as well as lemons. Now most water jugs with oranges, and lemons in are just a slice, which really is ornamental, because it has no benefit, you either have to squeeze the fruit in the water or have so much fruit sitting in the water for at least an hour before to reap the benefits of the vitamins which are in the fruit. 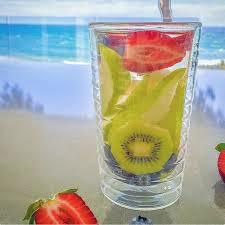 I do wonder how far we can go with the fruit in our water. Lemon, and lime benefits weight loss, it can aide the reduction of fat tummy syndrome. Your urinary track, warm lemon water cleanses your body in many ways. The skin thrives on the cleansing effect. Vitamin C, citric acid, flavonoids, B- Complex vitamins, calcium, copper, iron, magnesium, phosphorus, Potassium, and fibre. Lemons contain more potassium than apples or grapes. Potassium is beneficial to the heart. 1/ Lemons are alkalizing for the body. Lemons are acidic to begin with but they are alkaline-forming on body fluids helping to restore balance to the body's pH. 2/ Lemons are rich in Vitamins C and flavonoids that work against infections like the flu, and colds. 3/ Your liver loves lemons. The lemon is the wonderful stimulant to the liver, and is a dis-solvent of uric acid, and other poisons, liquefies the bile. Lemon juice in a warm glass of water in the morning is a great liver detoxifier. 4/ Lemons clean your bowels. Lemons increase peristalsis in the bowels, helping to create a bowel movement, and helping with regularity. 5/ The citric acid in lemon juice helps to dissolve gallstones, calcium deposits, and kidney stones. 6/ Vitamin C in Lemons helps to release free radicals linked to aging, and most types of disease. 7/ The Lemon Peel contains the potent phytonutrient tangeretin, which has been proven to be effective for brain disorders like Parkinson's disease. ​8/ In India, Ayurveda medicines values the lemon as a fruit, and for it's properties. It is sour, warm, promoter of gastric fire, light, good for vision, pungent, and astringent. 9/ It destroys intestinal worms. 10/ When there is insufficient oxygen, and difficulty in breathing (such as when mountain climbing) lemons are very helpful. The first man to reach the top of Mt Everest, Edmund Hilary, said that his success on Mt Everest was greatly due to lemons. Lemon are extremely good for Asthma, warm water, and lemon first thing in the morning before anything else, and wait for 20 minutes before having any drinks etc. 11/ Lemons have powerful antibacterial antibacterial properties. Experiments have found that the juice of lemons destroy the bacteria of malaria, cholera, diphtheria, typhoid, and other deadly diseases. 12/ Blood vessels are strengthened by vitamin P (bioflavinoids) in lemon. It is also useful in treating blood pressure. ​13/ Lemons contain 22 anti-cancer compounds, including natural occurring limonene oil which can slow or halt the growth of cancer tumors in animals, and flavonol glycosides which stops cell division in cancer cells. Not yet tried on humans. Oranges are one of the best fruits, and one of the most popular fruits. Being extremely acidic it needs to be in a juice form, and taken at breakfast, and then the body can digest it throughout the day, I am taking mine with a small amount of warm water each morning, half an orange squeezed for the juice, with a dash of warm water. Oranges are full of Vitamin C, and because of that there is a great healing power. Fruit doesn't have to be expensive, if you are eating a few fruits a day then cut then in half, and save for the next day. 1/ Oranges are full of Vitamin C. They promote healing. Immune system. 2/ Oranges protect against cancer. 3/ Oranges protect, and heal the kidneys. Protects against Liver, and Kidney Cancer. 4/ Oranges are an energy booster, and helps breathing. ​5/ Oranges aids digestion, freshens the skin, reduces inflammation, helps you lose weight. 6/ Oranges helps with the healing of viral infections. ​A few of the benefits of oranges. 1/ The fibres in oranges are good for the digestive system, and can relieve constipation. Fibres also reduce cholesterol which is helpful in preventing atherosclerosis. Fibres are also good in keeping the blood sugar levels in control. So the fibres in oranges are definitely in the list of the top health benefits of oranges. 2/ Cardiovascular health. The high vitamin C, flavonoids, and phyto-nutrients in citrus fruits reduce the rick of heart disease. 3/ Blood pressure benefits are that the Magnesium, and a flavonoid called hesperidin in oranges help regulate high blood pressure. 4/ Blood, and oxygen. Oranges are rich in Iron, and Vitamin B6, essential in the production of red cells in the blood, which carry oxygen from lungs to cells. Oranges also prevent lung cancer. 5/ Bones, and Teeth. Oranges are also rich in Calcium, associated with healthy bone structure, and teeth. 6/ Skin Health. Skin Health is one of the most important health benefits from oranges. Antioxidants in oranges protect the skin from cell damage, and free radicals. Having anti-ageing actions. 7/ Lower Cholesterol. Besides the fiber intake, oranges also help in reducing cholesterol through synephrine, an alkaloid found in the orange's peel. Antioxidants also contribute to the reduction of cholesterol. 8/ Folate intake. One orange provides about 10% of the necessary daily folate intake. Folic acid is helpful in skin health, and brain development. 9/ Immune System. Vitamin C stimulates the production of white cells in our body, thus improving the immune system. 10/ Kidney health. A lot of people know that among the top health benefits of oranges is also kidney health. Regular consumption of oranges significantly can reduce the size of developing kidney stones. 11/Prevent Ulcers. Vitamin C is efficient in preventing stomach ulcers. 12/ Viral Infections. Mostly due to the abundance of the flavonoid polyphenois. oranges protects against viral infections. So try to eat as much oranges in the flu season. 13/ Oranges are helpful in preventing several other diseases; like arthritis, asthma, bronchitis, tuberculosis, pneumonia, rheumatism, and diabetes. 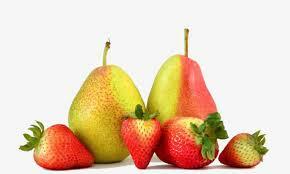 Pears .. Strawberries .. Kiwis .. Blueberries .. Are all fruits that you should be having in your fruit week. Find that porridge, and add a fruit of your choice. Pears are full of antioxidants, vitamin K, vitamin C, small amounts of Potassium,Calcium, Iron, Magnesium, Riboflavin, vitamin B6, and Folate. Pears which have the red skin have Carotenoids, flavonols, and anthocyanins. I am not a great lover of apples, and I would say to you to try the pear as the pear has something more about it, and is one to exchange the apple with. It does all the normal protection, and helps against Cancer, its wise to eat fruit everyday. They contain a fair amount of vitamins C, K, B2, B3, and B6 all beneficial for those mums who have just given birth. Vitamin K in pears prevents blood clotting, and improves circulation in the body. So instead of an apple try a pear. Strawberries, and here's a did you know: In medieval times Strawberries were served at important functions to bring peace, and prosperity. Serve them Strawberries up, and yes there are so many ways of serving the delightful Strawberry. Champagne sounds good to me. They contain iron, copper, magnesium, phosphorus, vitamin B6, vitamin K, and vitamin E. Vitamin C, folate, B9, potassium. Strawberries have always been for something special, and sometimes people go for the colours where fruit is concerned. Be brave try whatever you want not what someone else wants you to try. The Kiwi for me are one of the best fruits ever, full of Vitamin C, K, E, folate, potassium, and antioxidants, that small fruit is a good source of fibre. This fruit benefits Asthma, Digestion, Vision Loss, boosts the immune system, helps blood pressure, reduces blood clotting, so this is a fruit I would say that you do need to try. There are only so many fruits that can benefit your body in the long run. There is also a trying something different, and finding that the same old apple can be transformed into a fruit that has more to offer. Blueberries I love, and my porridge loves too. The fruit that is tiny, but smacks a serious punch of nutrition. These small blue tasty fruits have so much antioxidants, they keep your brain healthy, your heart strong. High in antioxidants, help fight cancer, amp up weight loss, boost brain power, alleviate inflammation, support digestion, promote heart health. This fruit is a sure must for a daily dose of power fruit.